Normal, full term babies without jaundice run a little high — bilirubin production is two to three times higher than in adults, because they are born with a higher hematocrit. Also, fetal hemoglobin is great at holding on to oxygen, but has a shorter life span, and high turn-over rate, producing more bilirubin. 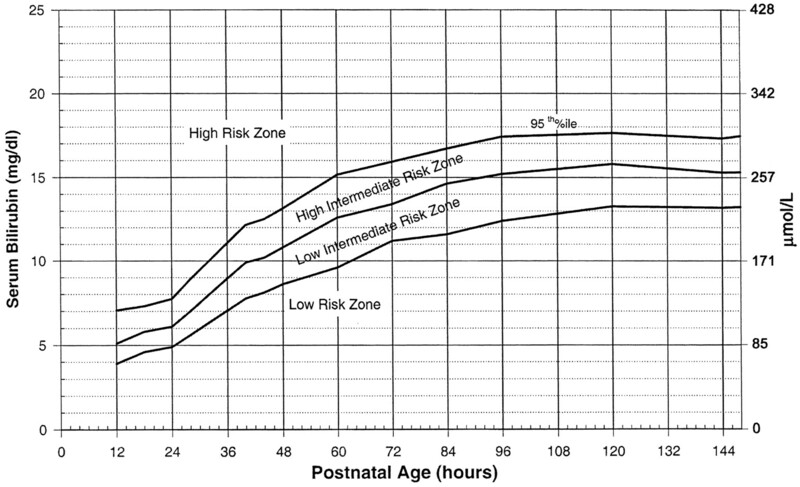 Check bilirubin and match this with how old the child is — in hours of life — at the time of bilirubin measurement. Babies need to stay hydrated. Breast feeding mothers need encouragement and need to offer feeds 8-12 times/day – an exhausting regimen. The main message is: stick with it. Make sure to enlist the family to support and help keep Mom hydrated, eating well, and resting whenever she can. Supplementing with formula or expressed breast milk is not routinely needed. 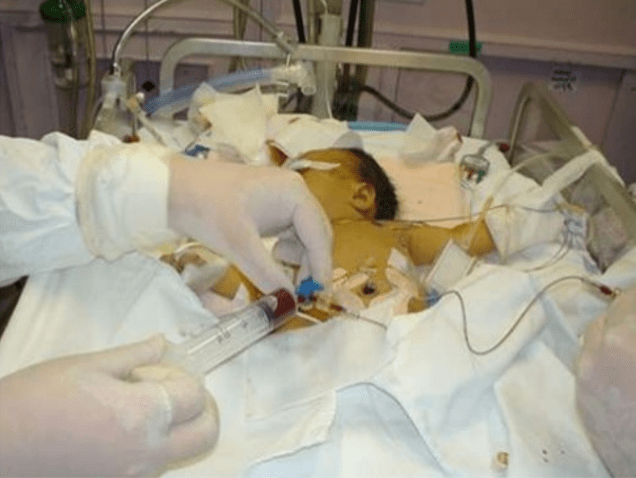 Be explicit that the neonate should not receive water or sugar water – it can cause dangeroushyponatremia. A moment of solid precautionary advice could avert a disaster in the making. 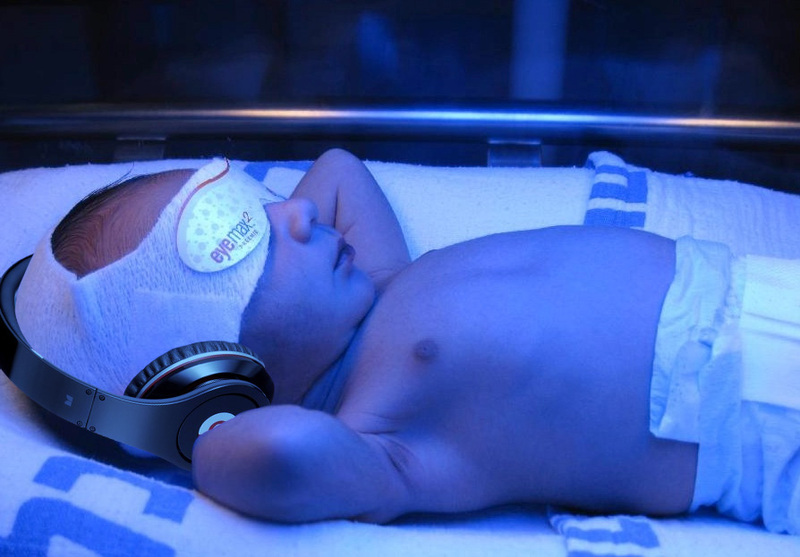 Bililights or biliblankets, provide the baby with the right blue spectrum of light to isomerize bilirubin to a more soluble form. 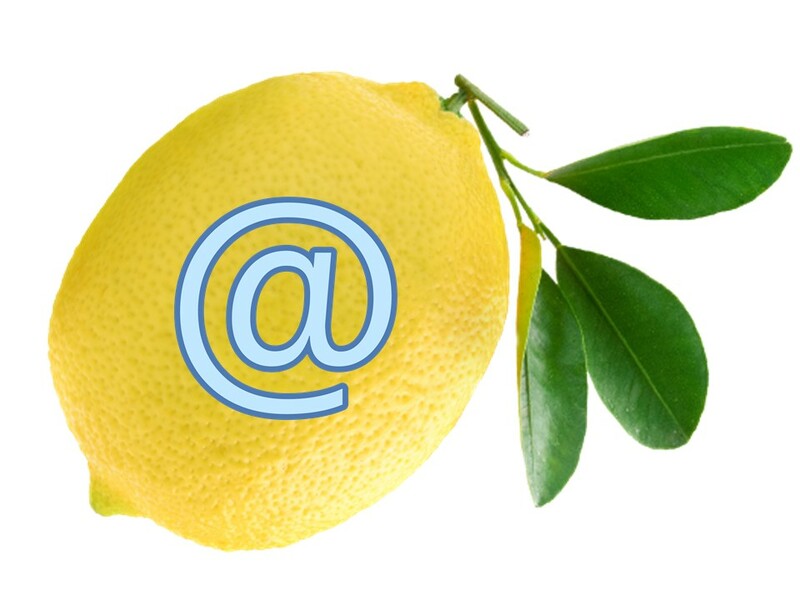 Traditionally, we have thought them to be more effective or safer than filtered sunlight. A recent randomized control trial by Slusher et al. 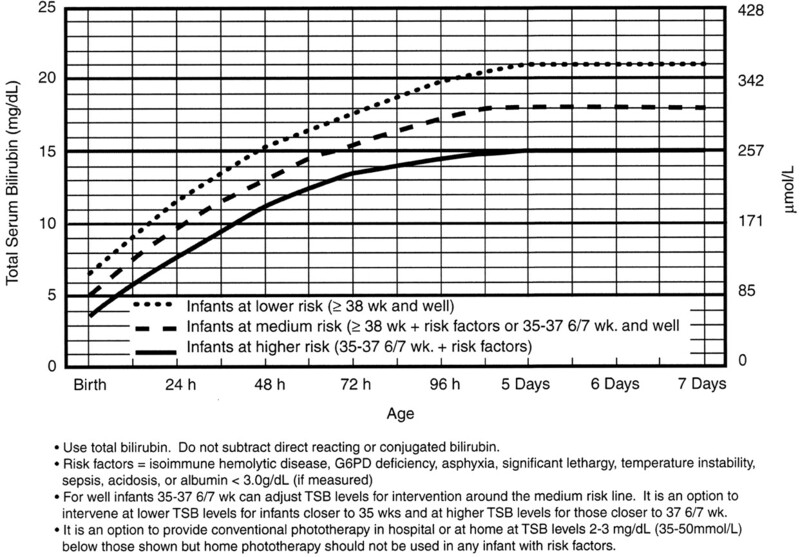 in the New England Journal of Medicine compared filtered sunlight versus conventional phototherapy for safety and efficacy in a resource-poor environment. These were all term babies with clinically significant jaundice in Nigeria. To standardize the intervention, they used commercial phototherapy canopies that remove most UV rays. None of them became dehydrated or became sunburned. The filtered sunlight resulted in a 93% successful treatment versus 90% for conventional phototherapy. My take away: we now have some evidence basis for using filtered sunlight as an adjunct for babies well enough to go home. The dehydration and neurologic dysfunction from hyperbilirubinemia may even cause fever. Check the bilirubin in any neonate you are working up for sepsis. Exchange transfusion involves taking small aliquots of blood from the baby and replacing them with donor blood. It’s often a manual procedure, done with careful monitoring. It can be done with any combination of umbilical arteries or veins with peripheral arteries or veins. In general, arteries are the output, veins are for transfusion. The baby may need a double-volume exchange, which ends up replacing about 85% of circulating blood, a single-voume exchange, replacing about 60% of blood, or any fraction of that with a partial volume exchange. It is a very delicate procedure that requires multiple hours and often multiple staff. For our purposes, just be aware that the jaundiced baby in front of you may need escalation of his care. 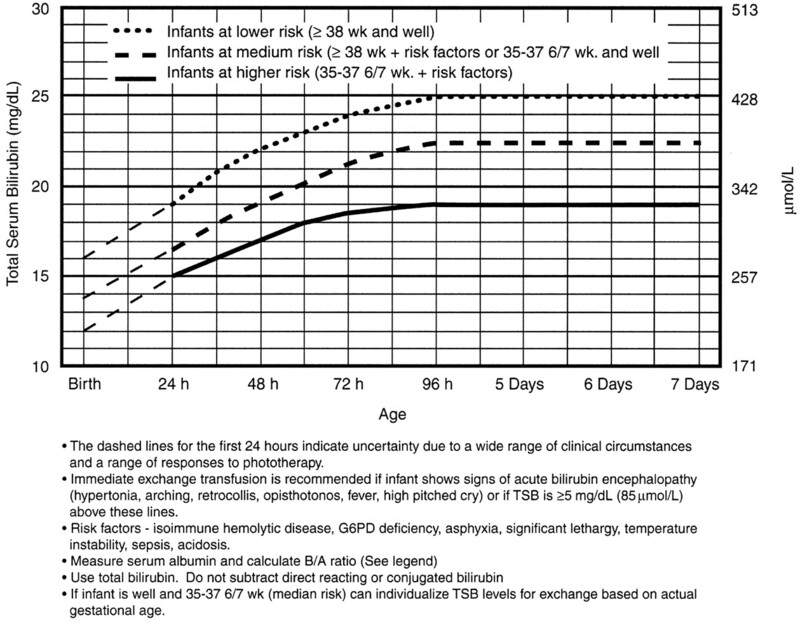 The child with high-intermediate to high-risk for developing severe hyperbilirubinemia should beadmitted for hydration, bililights, and/or assessment for exchange transfusion.